It was submitted by (someone impersonating as) A.D.A.M Staff. Adam.com is a healthcare related portal. Quite credible and famous. 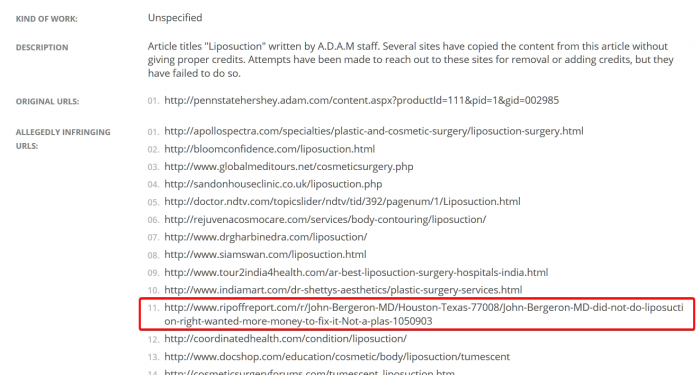 Article titles “Liposuction” written by A.D.A.M staff. Several sites have copied the content from this article without giving proper credits. Attempts have been made to reach out to these sites for removal or adding credits, but they have failed to do so. Here’s how it works. Reputation agencies don’t usually rely on any definite and reliable method to deliver results. So, they devise new ways to try and mislead Google. In this instance, they impersonate a credible publisher and file DMCA notice against dozens of low-level websites and blogs. In between, they slip in the actual target they want to remove. As you can see in the above list, they slipped in a Ripoffreport.com link hoping that Google staff removes it with other links. This method has been exposed by us in the past on several occasions. We got in touch with A.D.A.M and confirmed that they had nothing to do with this DMCA Notice. John Bergeron MD’s online reputation was in good health. There was no need fr any cosmetic surgery. It’s all ruined now ! John Bergeron MD is not a plastic surgeon or dermatologist. If you do a background check you will see he is a family physician. So I am not sure what you expected. It looks like all his background and training was in family medicine and he somehow also took on and went into cosmetic surgery. So next time do your research. In general, the medical training that provides the most training in cosmetics are plastic surgery and dermatology. A family doctor is trained to do a little of everything from ear aches to giving birth to babies. It is very different. Kind of like a BMW mechanic and a Ford mechanic, sure they both fix cars but they are very different areas. OR its like a plumber and electrician, both can work on your house. This complaint and/or review was posted on Webactivism.com on June 02, 2018 and is a permanent record located here: https://www.webactivism.com/john-bergeron-md-investigation-fraud-impersonation-perjury-fake-copyright-takedown-scam/. The posting time indicated is Central Standard Time. Furthermore, Webactivism.com has an exclusive license to John Bergeron MD investigation. It may not be copied without the written permission of Webactivism.com. This investigation on John Bergeron MD is submitted and written by one of our member. Any and all opinions and information are published as is. We does not edit or remove any aspect of the report and is merely a free-speech platform. As such, we cannot be held liable for the investigation reports and articles posted about John Bergeron MD.